Rosa Saltos and her American citizen sons (L to R) Andrew, Holger and Matthew Cardenas -- have held family meeting to talk about what happens if she's deported. The argument over immigration and deportation is no longer abstract – at least to some of those who have been living, working and raising families in Northeast Ohio. WKSU’s M.L. Schultze has the story of one family facing a changed reality this week. Tomorrow, Rosa Saltos and her pro bono lawyer head up to Brooklyn Heights for what’s usually a routine meeting with Immigration and Customs Enforcement. She’ll wait in a crowded room with scores of others for her name to be called. She’ll present paperwork and answer questions. And if the meeting ends as dozens of others have, she’ll come back to Akron, and continue to care for her three sons, work with oncology patients at Akron City Hospital, pay taxes and go to Mass at St. Bernard’s. Only this time, she’s worried. Saltos looks over at her oldest son, Holger. Absorbed by the video on a smartphone, he’s pretty much oblivious to the reporters’ questions. 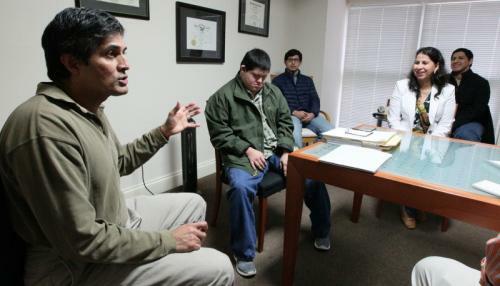 He has Down syndrome, and Saltos and her now ex-husband left Ecuador with a visitor’s visa when Holger was a toddler to try to ensure his medical care. She arrived legally in 1998 and went to what she thought was a legitimate lawyers’ office. But she ended up with a bogus green card and Social Security number, something she learned when she went to fileher taxes. It officially caught up with her in 2004, and she pleaded guilty to a felony that’s hung over her since. But not quite like this. “I want people to understand because I make a mistake, but I’m no criminal,” Saltos says. Since 2009, she’s been under what’s called an order of supervision. Her lawyer, Farhad Sethna, says that means she had to report monthly, then at least twice a year to ICE, which authorizes her work permit each year. Saltos’ oldest son, Holger Cardenas, is now 21 and a naturalized citizen, and he could sponsor his mother for citizenship here. Except for that felony. And with the new immigration policies of President Donald Trump, Sethna says it’s no longer clear ICE will be willing – or even have the latitude – to work with Saltos to remain under even her current status. So instead of focusing on celebrating her middle son’s upcoming graduation from high school and shopping for her first house – Saltos sat down with her boys to plan for a potential separation. She says Holger must stay; Ecuador’s healthcare system dictates that. Rosa Saltos 18-year-old son, Andrew (center) is inseparable from his older brother, Holger, who has Down syndrome. And there’s no question her middle son, Andrew -- now 18 -- would remain with Holger. It’s Andrew’s hand that Holger continuously clutches, and Andrew’s volunteered for four years at a camp for kids with special needs. He’s passionate about plans to major in special education at Kent State. The youngest son, Matthew, now 15, wants to be with his mother – wherever she is. But his mother shakes her head adamantly no. She says Ecuador is not a safe place for kids who were born and grew up in middle America. ICE would notcomment on this specific case, and the proceedings in Brooklyn Heights are not generally not open to the public. 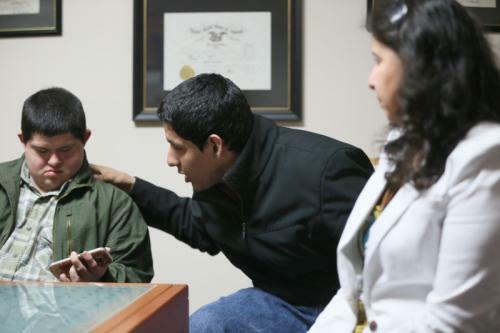 But Elizabeth Knowles, head of the University of Akron’s new immigration clinic, says many families are having the kind of conversations the Saltos family is having – and making other adjustments. What’s the difference between Trump and Obama? The Obama administration deported more than 2 and a half million people over eight years, which was a record. But the priorities, laid out most clearly in a Homeland Security memo in 2014, were national security threats, gang members, and those who committed felonies other than crimes connected to immigration status. Under the executive order President Trump signed in January, that changed. Anyone who authorities believe broke a law – including immigration law – is technically a priority. Saltos says she tried to make up for her green-card crime through her job as a nursing assistant working with cancer patients, by volunteering and by raising good boys. But recognizing she’s now a deportation priority, Rosa Saltos has also made sure her boys know what to do if they come home from school Tuesday, and she’s not there. Click here for links to related stories in the Akron Beacon Journal. Ohio’s Republican U.S. Senator says he’s not completely on board with his party’s presidential candidate on immigration – after Donald Trump delivered a fiery speech promising a crackdown on illegal immigration and large-scale deportations of undocumented immigrants. An Arizona woman who has lived in the U.S. for more than two decades was arrested Wednesday night after her regular check-in with immigration officials and has been deported to Mexico. She was sent to Nogales, Mexico, on Thursday, reports Katherine Fritcke of member station KJZZ. 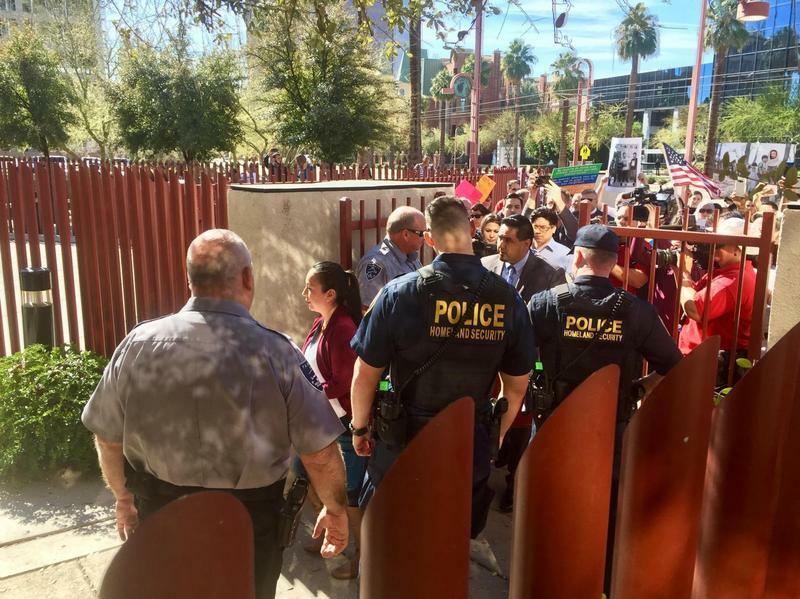 Guadalupe Garcia de Rayos' deportation — which has been protested by dozens of activists, some of whom were arrested late Wednesday — is a glimpse of how immigration enforcement is changing under the Trump administration.